We are pleased to announce our New & Improved CoQ10 Capsules for those seeking maximum cellular energy, advanced cardiovascular and immune support and resoraton of CoQ10 depleted by aging & cholesterol drugs (statins). CoQ10 is one of the most consumed supplements and health-changing antioxidants for cardiovascular support. Considered the “spark plus” of our cells, CoQ10 promotes cellular energy production in the heart, brain and muscle tissue of our bodies. Our New & Improved CoQ10 Capsules now also feature Hawthorn Berry and have been certified vegetarian. Hawthorn Berry – often called the “heart herb” has a long and enduring history as an herb to strengthen your heart – both physically and emotionally. Hawthorn Berry’s antioxidant flavonoids improve blood flow, guard agains blood vessel damage and even help to dilate blood vessels. Many studies have demonstrated that Coenzyme Q10 actually induced improvement in heart-muscle metabolism and was effective in aiding coronary sufficiency. It has been proven to improve the pumping capacity of the heart. Ninety-one percent of patients studied showed improvement within 30 days of beginning supplementation with Co-Q10. Each vegetarian capsule contains 100 mg. Co-Q10. CoQ10 capsules also works synergistically with Cardio Advantage Plus for maximum heart health. 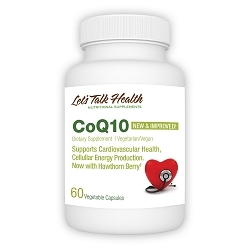 This is a good time to remind our long time Let’s Talk Health members and those that have just recently discovered our formulas about why CoQ10 is so essential to our daily nutrient intake and why we have added Hawthorn Berry to increase create a more powerful formula. In recent years, a number of randomized, double blind trials have demonstrated that Coenzyme Q10 (CoQ10) supplementation can effectively and consistently lower blood pressure in hypertensive subjects. CoQ10 is directly involved in the bioenergetic pathways of ATP production in heart muscle (myocardium). Research reveals that 39 percent of patients with high blood pressure have a deficiency of CoQ10. Supplementation with CoQ10 appears to correct this deficiency, correcting the underlying metabolic abnormality that leads to high blood pressure development. Most experts in this field believe that CoQ10 is able to lower blood pressure through its favorable influence on heart bioenergetics mechanisms and possibly relaxing vascular smooth muscle. Because CoQ10 corrects an underlying metabolic defect that leads to high blood pressure, lowering of blood pressure usually requires 4 to 12 weeks of CoQ10 supplementation. In a recent randomized, double blind trial among patients receiving antihypertensive medications, the addition of 60 mg of CoQ10, twice daily was shown to markedly reduce both systolic and diastolic blood pressure. Our New & Improved CoQ10 Capsules contain a full 100mg per capsule – higher than many on the market – plus we have added Hawthorn Berry. The authors of the study conclude that CoQ10 decreases blood pressure possibly by decreasing oxidative stress (free radical generation) and insulin response in patients with known hypertension receiving conventional antihypertensive drugs. The hawthorn plant and its berries are a rich source of a unique strand of bioflavonoids, known as procyanidins. Like CoQ10, these procyanidins have been shown to reverse congestive heart failure by enhancing bioenergetic pathways within the heart muscle (myocardium). More recently, we have seen a number of intervention trials that demonstrate that hawthorn extract supplementation can also effectively reduce high blood pressure. The procyanidins in hawthorn act as cardiac glycoside agents that increase cyclic AMP and produce a vasodilation effect on arteries. The daily dosage of hawthorn berry required to lower blood pressure ranges from 100-250 mg, up to three times daily if taken as a sole antihypertensive agent. Our New & Improved CoQ10 Capsules contain a full 400mg per capsule – also higher than many on the market. Usually two to four weeks is required in order to see a significant decline in blood pressure in hypertensive patients. It is vital that you include CoQ10 to your daily regimen. If you have never experienced the life-changing effects of this powerful nutrient, our new and improved Certified Vegetarian CoQ10 with Hawthorn Berry would be an excellent choice.